Chamber East is your Function Suite in Dundee catering for up to 200 people for all types of events. Situated in the heart of Dundee, Chamber East is a flexible venue and is available for general hire. It is regularly used for a wide variety of functions including conferences, workshops, concerts, parties, weddings, fashion shows, ceilidhs and charity functions. Our venue provides all the necessary high standard facilities and is conveniently located in Dundee City Centre, next to McManus Galleries. Chamber East is at the site of Dundee’s old Royal Exchange, designed by David Bryce and built in 1855.This grade A listed building has a Flemish Neo-Gothic style that adds grandeur to any event. The Main Hall houses fully licensed bars and a kitchen that can provide all your catering needs. Situated on the first floor, the hall is accessible by the main stairs or for disabled access, a lift is available. We provide a catering service if needed for all types of events. The Hall is roomy and flexible so layouts of tables and equipment can be easily facilitated. or around 150 for weddings and parties. Chamber East provide a catering service for all and any type of event from birthday parties to corporate events and meetings. We have a selection of menu choices and prices. We can also provide a buffet service, again for any and all types of events. 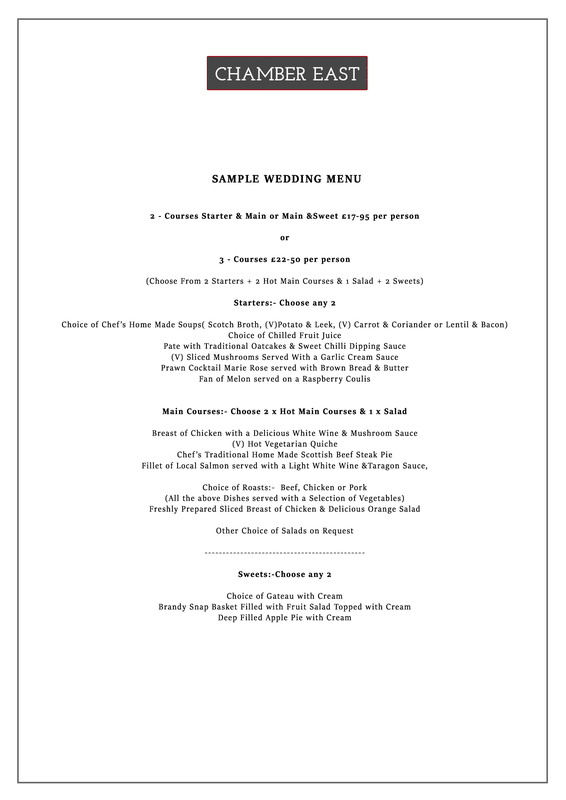 Please see our sample menus below. 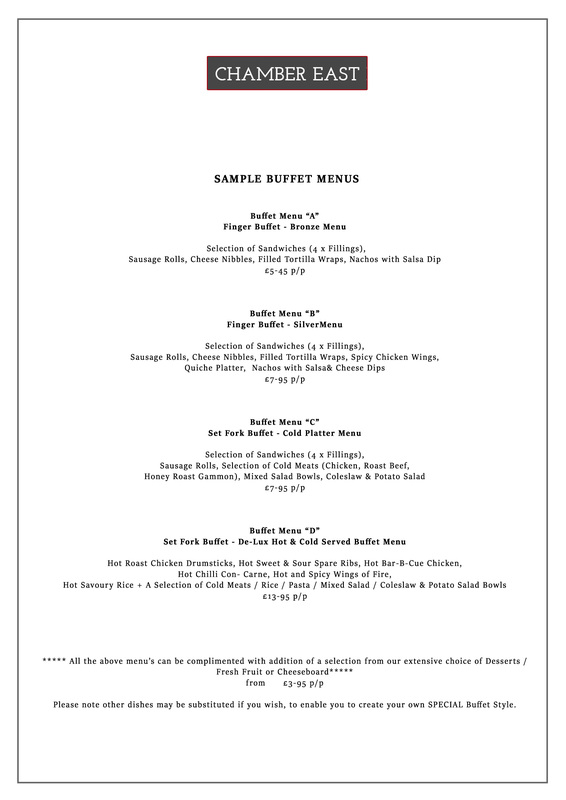 These can be changed to suit your needs or if you prefer to make your own menus our chefs can cater for your needs.